Video tutorials youtube:: Pinatas, flowers, 3D paper masks! Home / Video tutorials youtube Happythought TV! Video tutorials youtube Happythought TV! From pinatas, papel picados and paper flowers to miniature top hats and 3D paper masks, we’ll guide you through each craft project step-by-step with these fun and helpful video tutorials to get more ideas. Watch our Youtube video tutorials below or visit our Happythought youtube channel. How to make papel picado calaveras: Sugar skull decoration to make for Dia de los Muertos! How to make a Piñata: Cute Mini rainbow Piñatas for fiestas! Day of the Dead Calavera mask- Step-by-step video tutorial & free templates to download! 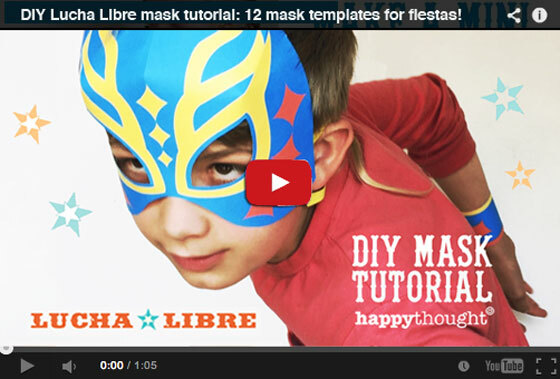 How to make a Lucha Libre mask – tutorial + free printable paper template! Printable Lucha Libre mask tutorial + easy costume idea! Day of the Dead cat mask + free DIY template! Try our animal mask set, wild animal mask set, calavera mask set, 12 lucha libre masks, carnival headpieces and Halloween masks. All the masks come with easy to follow instructions and templates for coloring in your own. We hope you enjoyed this page on some of Happythoughts popular videos!